Some time in the 18th or 19th century the dimensions of the ‘Archinto’ were modified to be more suitable for modern playing. This alteration seems to have taken place fairly early on; John Dilworth refers to a diary entry written by Count Cozio di Salabue in 1816, in which the latter mentions the successful reduction of the instrument, and conjectures that the work was carried out by the Mantegazza Brothers of Milan. In order to reduce the ‘Archinto’ to modern dimensions its upper bout has been shortened, while the body of the instrument has been made slightly more slender through the removal of a thin strip of wood at the middle joint on the belly and back. The outer contours of the lower bout and waist thus remain untouched; the alteration of the original proportions is only noticeable from the middle of the upper bout onwards. Thanks to this fairly cautious intervention, the original arching has been largely preserved, displaying the beautiful deep, wide sweep of the fluting, which is still heavily influenced by the Amati school. It is generally believed that Stradivari made the cello for the Cardinal (later Archbishop) of Milan, Giuseppe Archinto, although this is not supported by any documentary evidence. What is certain, however, is that the instrument was in the possession of Count Giuseppe Archinto – a descendant of the cardinal – around 1850, and was part of a quartet of Stradivari instruments in his collection. Following the death of the count, the cello was purchased in around 1862/1864 by the collector Gustavo Adolfo Noseda. 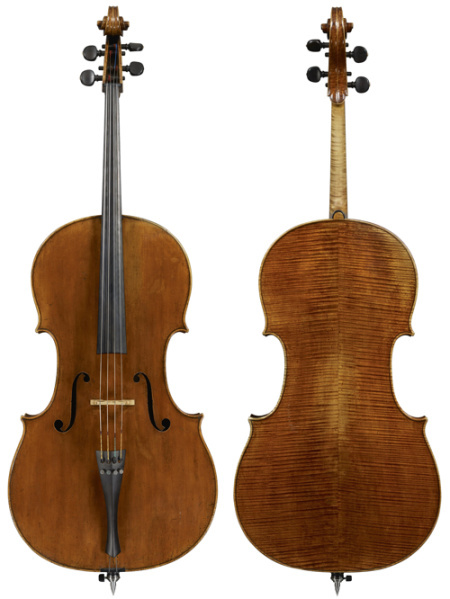 In around 1865 he passed it on to the French luthier and dealer Jean Baptiste Vuillaume, who had already purchased the other instruments from Archinto’s estate. Vuillaume sold the instrument shortly afterwards to Charles Wilmotte in Antwerp, who in turn sold it to the Parisian amateur cellist and collector Abel Bonjour. Shortly before his death, Bonjour loaned the cello to the 1885 South Kensington Exhibition. Following his death, the nine cellos in his collection were put up for auction at Hôtel Drouot in Paris on February 5, 1887. A longer version of this article will appear in the new volumes V-VIII of Antonius Stradivarius, to be published by Jost Thöne in April 2016. The instrument is described in detail in Dilworth, John, Antonio Stradivari Archinto Cello 1689, Usk Publishing Ltd, London, 2014. Dilworth, op. cit., p. 18. In the W. E. Hill & Sons certificate of April 11, 1932, the alteration is still attributed to Jean Baptiste Vuillaume. See, for example, Doring, Ernest N., How Many Strads? Our Heritage from the Master, Bein & Fushi, Chicago, 1945, reprint 1999, pp. 65–67. Letter from Hill to Russell B. Kingman, April 11, 1932, p. 1. Dilworth, op. cit., p. 9. Letter from Hill to Kingman, op. cit., p. 1. Letter from Hill to Kingman, op. cit., p. 2; certificate by Albert Caressa Succ., July 25, 1932. Sales receipt from Silvestre & Maucotel, October 30, 1915. Kingman, Russell Barclay, The ‘Archinto’ Violoncello—Antonius Stradivarius, Cremona, 1689, A.W. Elson, c. 1925. Certificate and sales receipt from Rudolph Wurlitzer Co., January 11, 1937; Doring, Ernest N., The ‘Archinto’, Violins 1, Number 3, 1938, p. 96, fig., p. 86. Dilworth, op. cit., p. 11. Certificate and sales receipt from Rembert Wurlitzer, June 23, 1960. Written transfer of ownership from Walter Lagemann to the Music Academy of the West, December 17, 1974. Certificate of sale and transfer of ownership from the Music Academy of the West to the Richard D. Colburn Foundation, August 18, 1976. The Robertson Collection, Albuquerque, 2009, p. 6 (supplement, The Strad, May 2009).